#88 "Fighting General Winter, Winter Warfare in Russia, Finland & Holland (1939-1945)"
This issue's theme is particularly relevant for the season, as it examines winter warfare in the period of 1939-1945. While we look at a variety of battles from this time that take place in snowy conditions, there's a special focus on the Germans and Russians in Finland. 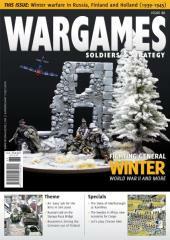 Articles include a look at Finnish Motti tactics, The Battle of Rovaniemi, and a raid on Staraya Ruza Bridge. Off-theme articles include a refight of the Battle of Ramillies, a couple of scenarios for the new Congo ruleset, lists for Swordpoint, and a painting guide for Victrix's new Numidian cavalry...and much, much more!